Mystery Lovers' Kitchen: Guest Blogger: J.J. Murphy! Hello, friends, and Happy New Year! 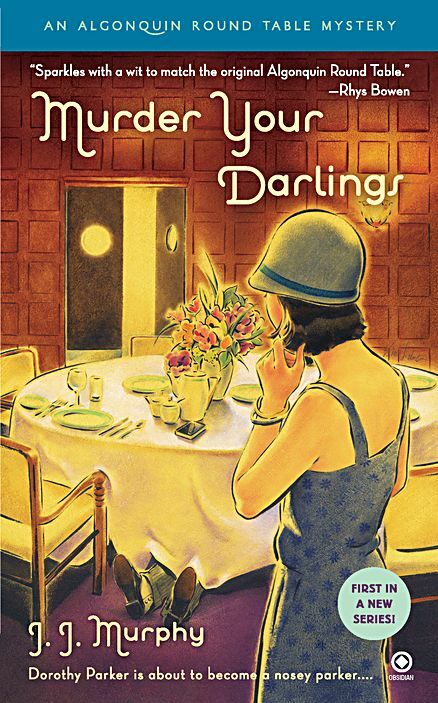 Please join me in welcoming the wildly cool and enviably brilliant J.J. Murphy to the Kitchen ... J.J.'s Algonquin Round Table Mystery series launched last January with Murder Your Darlings. The most recent, You Might as Well Die, came out last month. They're delightful must-reads for cozy fans as well as lovers of historical fiction, traditional mysteries, and generally clever prose. Three, I’m under the table. Robert Benchley, Dorothy’s dear friend and another member of the Algonquin Round Table, also loved a martini. He’s known for this famous line: “Why don’t you get out of those wet clothes and into a dry martini?” Good idea, Mr. Benchley! To that end, here’s the recipe for a classic martini. Take note that it’s only 3 ounces of liquid, compared to the 7-ounce or mammoth 10-ounce cocktails that bartenders serve today. That’s how they did it back then. It was small enough that the drink stayed chilled until you finished it. Pour the ingredients into a cocktail shaker half filled with ice cubes. Stir or shake for one minute. Strain into a cocktail glass. Garnish with the olive or lemon twist. Drop the sugar cube into a champagne glass and soak it with the bitters. Fill the rest of the glass with champagne. Garnish with the lemon twist. Option: add an ounce of cognac. Shake the liquid ingredients together in a cocktail shaker half filled with ice cubes. Strain it into a cocktail glass or small brandy snifter. Garnish with the nutmeg. 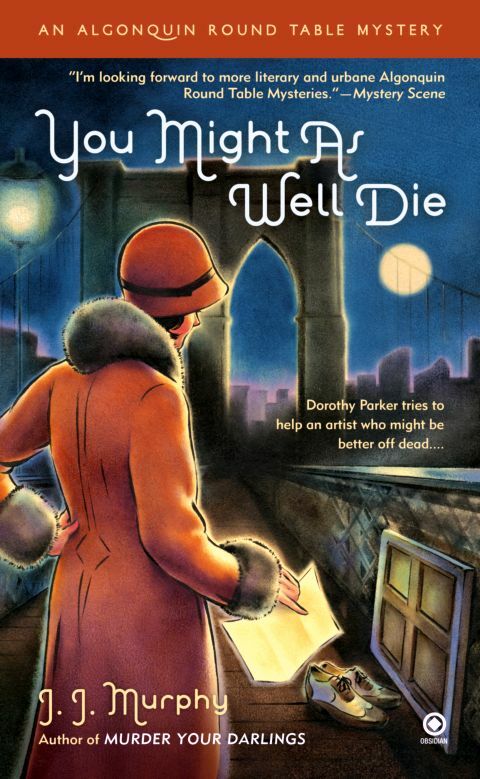 In YOU MIGHT AS WELL DIE, J.J. Murphy’s latest Algonquin Round Table Mystery, Dorothy Parker and Robert Benchley try to figure out why a second-rate illustrator jumped off the Brooklyn Bridge. Meanwhile, they’re busy scrounging up enough money to pay off their bar tab at their favorite speakeasy—and debunking Halloween séances with Harry Houdini. Thanks for joining us today, JJ. Traditional martinis are a little bit too strong for me, but the ingredients in the Brandy Alexander sound a little less powerful. I might just try one! The quotes are priceless! I might actually be able to finish the smaller martini, as long as it had lots of olives! I've been a Dorothy Parker fan for many years. I haven't read any of your books yet, but I will. It sounds like such a fun series! To the "cooks" in Mystery Lovers' Kitchen, thanks for letting me drop by today. To Krista and Janel, it's easy to try out these cocktails at home, even if you only have a few sips. It's a lot easier than buying one at the real Algonquin Hotel, where one cocktail will set you back about $20! Cheers! Hi J.J. ~ So glad I found out about your series! 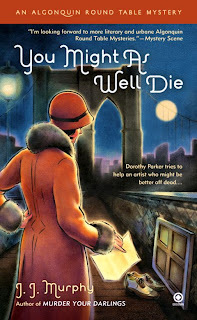 I'm a great fan of Dorothy Parker and her crowd, and love reading about the lifestyles of the 1920's. I've always been more of a vodka gal, but did discover several years ago the wonders of a cold martini on a hot summer's evening, made with Bombay Sapphire Dry Gin. And I'm with Janel, I like plenty of good olives in mine, too! Krista, Brandy Alexanders make for a nice after-dinner drink, in place of dessert. My mother's never been much of a drinker, but she used to order one occasionally when we went out to a nice restaurant for a celebration. Very tasty!